Physicians are realizing how easy-to-use mobile dictation apps like Dragon One and Mobius Scribe can streamline clinical documentation. Using a smartphone and the latest speech-to-text medical dictation software, doctors can reduce charting time by hours each week. 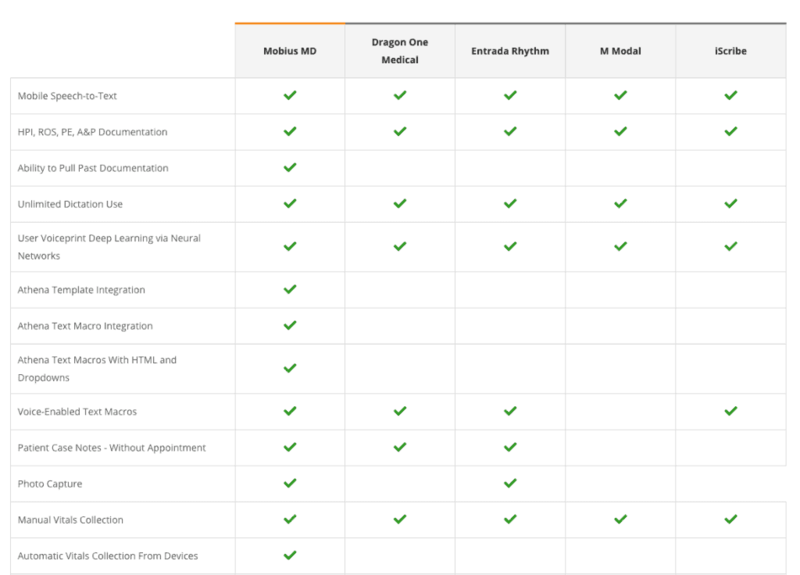 Dragon Medical has been a popular dictation software for years. Their speech recognition platform, built by Nuance, is the most advanced medical dictation technology available. But Nuance’s software is also available via Mobius Scribe, a premium dictation platform with more features and a smoother user interface than Dragon’s Medical One. Mobius makes the world’s most reliable speech-to-text medical dictation available within the leading app for EMR workflow optimization. The key to efficient mobile dictation is easy and intuitive integration with the electronic medical record. Mobius was designed for doctors, by doctors, so that dictations seamlessly synchronize with your existing EMR. Nuance’s software is also available via Mobius Scribe, a premium dictation platform with more features and a smoother user interface than Dragon’s Medical One. If these four features would enhance your practice, it’s time to upgrade from Dragon to Mobius. You use past documentation features on your desktop EMR, so why waste time re-writing your notes on mobile? Mobius Scribe is the only app that makes previous encounter documentation available from your mobile device. With just a single tap, go from dictating to quickly populating the patient chart with past text or templates. Many providers using mobile dictation also enhance clinical documentation with images. Both dictation and photo capture can eliminate hours spent with the EMR. Mobius transmits images you select directly to your EMR, whether it’s from a PACS or a smartphone camera. Photo capture functionality is seamlessly integrated into the same Mobius app. Dragon does not support photo capture. Mobius is especially valuable for providers who use athenaClinicals. The app provides unparalleled access to athenahealth EMR features, including template integration and text macros with HTML and dropdown. Mobius Clinic is the first and only app to make these athenahealth features available for mobile. Templates and text macros are seamlessly integrated with the app’s dictation software, so you can document the patient narrative your way. Dragon One is a dictation software, while Mobius combines the same speech-recognition functionality with a complete suite of mobile tools. The result is the leading app for EMR workflow optimization. In addition to medical dictation, your team can use Mobius to automate vitals collection, instantly scan documents, manage patient intake, review patient profiles, and much more. See a full list of Mobius features that aren’t offered by any other medical dictation app. Mobius offers medical providers and staff Next Generation Speech-to-Text as well as a complete suite of mobile tools. See how we compare with our competitors.